Participants: Mario Aguilar , Marcello Averbug, Hugo Benito, Alfonso Caycedo, Ruth Connolly, Clara Estrada, Jorge Garcia-Garcia, Emilio Labrada, Alvaro López, Orlando Mason, Ítalo Mirkow, Jairo Sánchez, Ginger Smart, Carlos E. Velez, Ricardo Zavaleta, German Zincke. Clearly, there are very few New York wines available outside of the state of New York (unless one orders on-line). New York State wineries account for only 4% of wines produced in the USA. The number of wineries, mostly located in a climate moderated by the Finger Lakes, is rather limited, and production is insufficient to supply stores throughout the whole country. 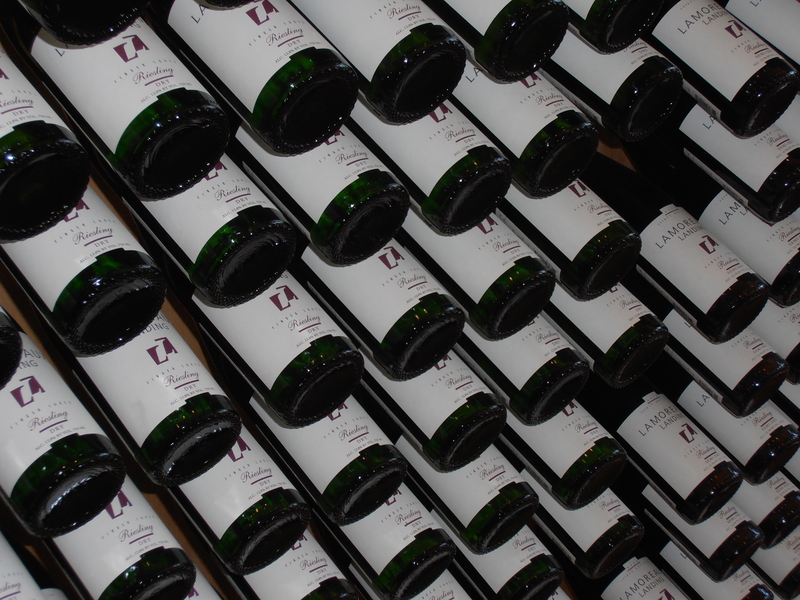 Fortunately, it was possible to locate some wines so that the Club could sample these few. They are not too expensive. The quality of wines from this region varies considerably, but considering the investment, it is generally worth the price. Certainly seems like something worth trying from time to time, but will leave that up to the individual members. 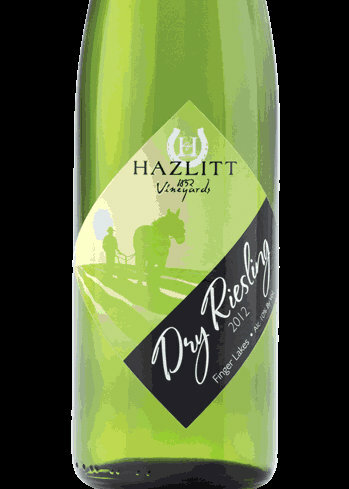 Hazlitt Riesling is produced in the Finger Lakes region. It has aromas of spring flowers that harmonize with sweet flavors of honey and the first peaches of summer in this well-made Riesling. With a palate balanced with fruit, acidity and a mineral finish, this is a great selection for those partial to a sweet style, well-made Riesling. Characteristics: Crisp, Apple, Lemon, Medium bodied. Coho Red is exquisitely balanced to present an easy to drink, slightly fruity off-dry taste. Flavors of raspberries and cherries are wrapped in a soft full-bodied style making this an ideal everyday wine. 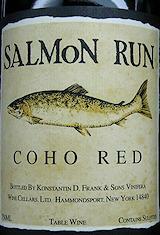 The Salmon Run Coho Red is a product of a winery known mostly as “Dr. Frank’s” established by Konstantin Frank, who came to the USA from Ukraine and set up his business with the help of a French enologist in 1962. It´s a family-run operation now going into its fourth generation, and has won more awards since 1962 than any other NY State winery. An excellent balance of fruit and oak make this full-bodied, dry red ideal with all red meat dishes. Criterio para calificar: Excepcional: 96-100 puntos; Excelente: 90-95 puntos; Muy Bueno: 86-89 puntos; Bueno: 81-85 puntos; Aceptable: 75-80 puntos. Impresion General: Un vino acido/dulce con poco aroma y sin caracteristicas especiales. Impresion General: Un vino sin sabor, sin aroma e incoloro. Un poco dulce. Impresion General: Este vino tinto, presenta caracteristicas de los vinos dulces, es aceptable para los que gustan de tintos dulces. Color rojo bastante acentuado con muy poco aroma. Impresion General: Se encontró con poco aroma y con un sabor que puede aceptarse como agradable, tambien observa un final muy corto. New York wine refers to wine made from grapes grown in the U.S. state of New York. New York ranks third in grape production by volume, after California and Washington. Eighty-three percent of New York’s grape area is Vitis labrusca (native varieties, mostly Concord). The rest is split almost equally between Vitis vinifera form Europe and French hybrids. NY State has 9 AVAs, (Cayuga Lake AVA, Finger Lakes AVA, Hudson River Region AVA, Lake Erie AVA, Long Island AVA, Niagara Escarpment AVA, North Fork of Long Island AVA, Seneca Lake AVA, The Hamptons, Long Island AVA) and is the second largest producer of wine in the U.S., boasting 4 wine-growing regions and 8 AVAs. New York is also one of America’s oldest commercial wine states, with a wine history dating to the 1860s. Today, vineyards are found in nearly half of its counties. New York’s wine regions reach from the shores of Lake Erie to the tip of Long Island, encompassing a wide range of terrain, climate and wine styles. Much of this production is still from native American labrusca varieties like Concord and Niagara, grown primarily for kosher wines. The balance is split between wines made from French-American hybrids, and an ever-expanding catalogue of classic vinifera varieties. The largest actual vineyard area is the Lake Erie District AVA, which extends into Pennsylvania and Ohio. New York State’s wine production began in the 17th century with Dutch and Huguenot plantings in the Hudson Valley region. Commercial production did not begin until the 19th century. New York is home to the first bonded winery in the United States of America, Pleasant Valley Wine Company, located in Hammondsport. It is also home to America’s oldest continuously operating winery, Brotherhood Winery in the Hudson Valley, which has been making wine for almost 175 years. Furthermore, New York State is home to North America’s oldest dedicated sacramental winery, O-Neh-Da Vineyard, now operated by Eagle Crest Vineyards on Hemlock Lake in the Western Finger Lakes region. In 1951 Dr. Konstantin Frank emigrated from the Ukraine to New York, to work at Cornell University’s Geneva Experiment Station. Frank was hired by Cornell as a janitor at the Geneva Experiment Station. Though he was a respected viticulturalist in Ukraine, this was the only position for which his American work experience, which consisted of his being a janitor at Horn & Hardart‘s cafeteria in New York, qualified him at the time. He spent his spare time at Cornell attempting to convince his colleagues that the failures of quality wine production in New York had to do with their choice of vines. He believed that choosing the correct Vitis vinifera vines would yield great wines in the Finger Lakes. With three-hundred years of failure preceding his theory, his colleagues were skeptical. Combined with a language barrier (although Dr. Frank spoke six languages fluently, (English was not one of them) his vision would have to wait for an appropriate ear. Dr. Frank continued to promote his beliefs on the potential of the Vitis vinifera in New York until Charles Fournier, a French Champagne maker and president of nearby Gold Seal Vineyards took heed and hired him. The two shared the common language of French as well as a passion to plant Vitis vinifera in the Finger Lakes region. A decade later, Dr. Frank was producing quality wines from such Vitis vinifera vines such as Riesling, Chardonnay, Pinot noir, Gewürztraminer, and Cabernet Sauvignon. This set the stage for further plantings of Vitis vinifera vines in New York, aided by the boost to the New York wine industry given by the New York Farm Winery Act of 1976, which eased the process of opening a farm winery. Wineries have worked to choose the proper varietals that grow well in the unique terroir of the state. 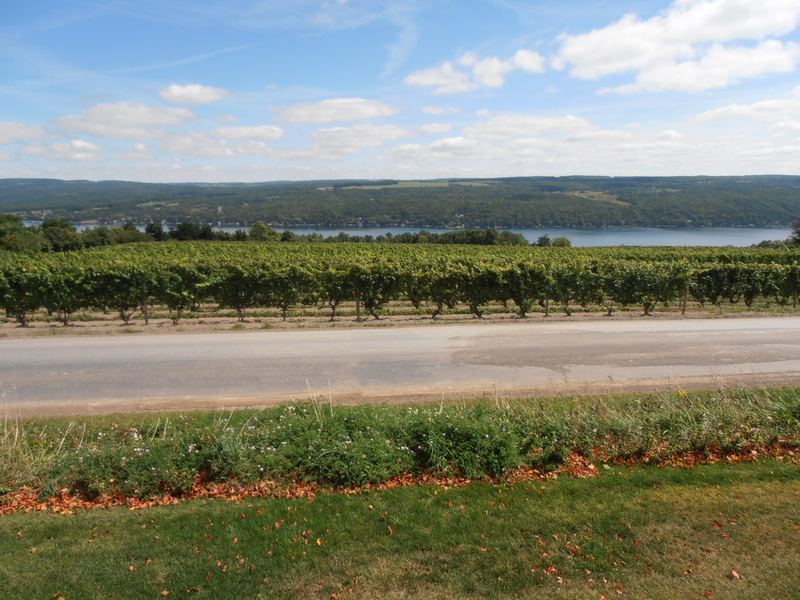 The Finger Lakes region would eventually become the central area of New York’s wine industry in the 20th century. In 2011, the New York wineries were given another boost when Governor Andrew Cuomo signed the Fine Winery Law into law, allowing each farm winery to operate up to 5 tasting rooms as a single entity, rather than requiring a separate license for each. The act also streamlined the paperwork involved in direct shipping wine to customers, and allowed wineries to use custom-crush facilities or rent equipment and space from existing wineries, rather than requiring wineries to own all their own equipment. Vitis vinifera, Riesling grapes are used to make some of the highest quality wines in New York, others are made from French hybrids, American hybrids and Vitis labrusca. There are four major wine-growing regions: Lake Erie AVA on the western end of the state, the Finger Lakes AVA in the west-central area, the Hudson River Region AVA in eastern New York, and the eastern end of the Long Island AVA. In 1976, when the Farm Winery Act was passed, the Finger Lakes and Long Island regions had 19 wineries. By 1985, there were 63 wineries, and now the regions hold approximately 212 wineries.Wine Regions’ Soils and Climate. The wine regions’ soils originated from the last glacial advance which left gravel and shale type soils with heavy clay deposits in the Finger Lakes region and sandy soil in the Long Island region. The climate differs amongst the regions based on the Atlantic Gulf Stream and the numerous bodies of water and mountainous regions around the state. The annual precipitation ranges from 30 inches (76 cm) to 50 inches (127 cm). The growing season in the Lake Erie and Finger Lakes regions ranges from 180 to 200 days a year, while on Long Island, the season is extended to 220 days and the humidity is higher and the fall precipitation is somewhat higher as well. The Adirondack Coast Wine Trail is New York’s newest wine region. Established in 2013 the region’s wineries successfully argued the regions unique terroir, with unique glacial soils, the weather systems which flow off the Adirondack Mountain range and flow down over Lake Champlain, and the effect of one of the worlds oldest reefs in the Lake itself, make this area deserving of its own designated wine trail. The region was consistently overlooked as a potential grape growing region until one of the budding wineries, Elfs Farm Winery & Cider Mill, came out of no where to win “Specialty Winery of the Year” at New York’s largest wine competition. Receiving rave reviews even though no one in attendance was familiar with this region, the press in attendance gave this startup wine region the legitimacy it was seeking. This entry was posted in Meeting Abstract and tagged New York State. Bookmark the permalink.